With so many different mobile devices a single person owns and carries around each day, it makes perfect sense to be armed with an adequate power bank. After all, you can never quite tell just when you need to juice up your smartphone or smartwatch in order to remain on top of things. 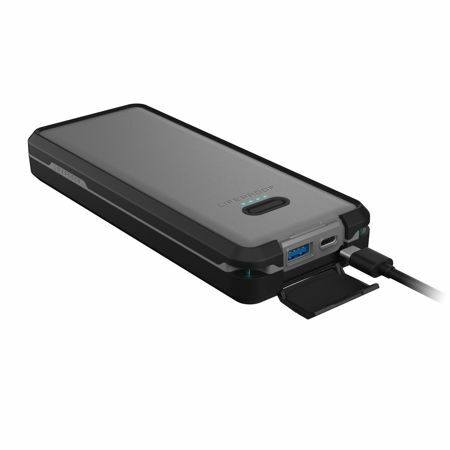 Mobile charging for power-hungry devices becomes easier with the LIFEACTÍV Power Pack 20 from LifeProof. This is a travel-friendly battery pack which is versatile enough to be carried with you wherever you go, being built to keep smartphones, tablets, laptop and even handheld gaming systems charged. Based on LifeProof’s legacy of four-proof protection from water, drops, dirt and snow, the LIFEACTÍV Power Pack 20 is certainly hardier than it looks. Even better yet, it was specially built to perform even under less than ideal circumstances. Having available power in a light, easy-to-carry form which will be able to add hours of productivity to a laptop, smartphone or even keep you entertained as you are on the move makes it an indispensable tool for the frequent traveler. The LIFEACTÍV Power Pack 20 sports dual 10,000-milliamp batteries underneath the hood with a 74-watt-hour capacity. This means the Power Pack 20 is able to fully charge a laptop or even function as the sole smartphone power source whenever you decide to take some time out from civilization over a weekend. You can also charge Power Delivery-compatible devices such as the Nintendo Switch or wireless headphones courtesy of a dual-role USB-C connection, and additional time is saved as you juice up a Power Delivery-compatible handset such as like the latest iPhones and Android devices. Each Power Pack 20 has been designed to be waterproof to 6.6 feet for up to an hour, and it is also drop proof to 6.6 feet while having its crucial segments sealed from dirt and snow. The built-in flashlight feature will let the Power Pack 20 double up as a torch on your travels while saving your smartphone from draining its battery further when using a flashlight app. I have only one gripe though: the $99.99 LIFEACTÍV Power Pack 20 arrives in only black.